Ram's Laramie Limited trim level gets a new grille and lots of chrome. 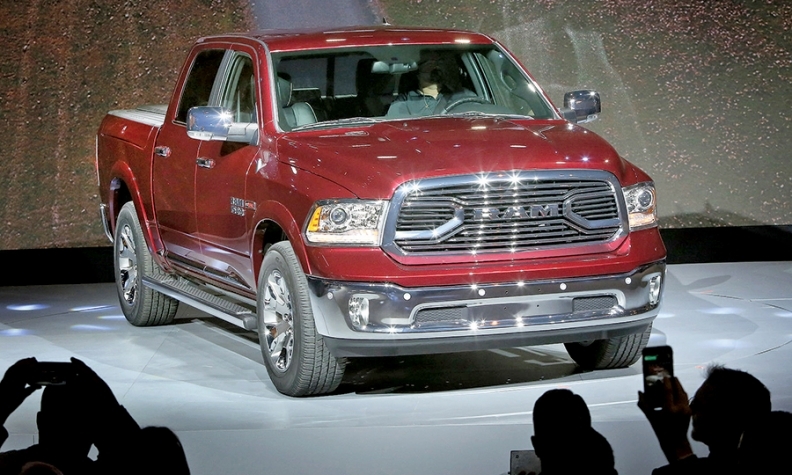 CHICAGO -- Ram has given its top-end Laramie Limited pickup more chrome and a distinct new grille. The refreshed Laramie Limited unveiled at the auto show here will be available on the light-duty Ram 1500 in the second quarter as a 2015 model and on heavy-duty pickup models in the third quarter as 2016 models. The trim level is intended to cater to high-end pickup buyers who use their vehicles extensively but prefer luxury features. "This is a whole different set of customers, not one that you would normally associate with a pickup," said Ram brand boss Bob Hegbloom. "These are the guys that go to work, but they own the company." Hegbloom said that 20 percent of all of the pickups Ram sells are in its top-level Laramie trim or above, including the Laramie Limited and the western-themed Laramie Longhorn. The Limited's refreshed exterior styling is a departure from the big-rig-inspired grille on the current model, which features a thick crosshair over a crosshatch mesh, capped with the Ram's head logo. In the new grille, the brand's name in chrome replaces the Ram's head and sits in the center over chromed horizontal lines that cover the opening except for large twin ports on either side of the all-capitals RAM. A redesigned tailgate also eliminates the familiar Ram's head logo in favor of the brand's name in 5-inch tall capital letters, capped in chrome.